We occasionally run raffles at work and at each occasion we need paper, pen and scissors. We write either the names, or assign numbers to the names, cut these into strips, roll these up, place these in a bag, then make a random draw. Really old school. Of course we really do not mind doing this inspite of the many action items needed to accomplish the task. Must be because of all the excitement this entails. However, I just found a faster alternative to the requirement of randomness. 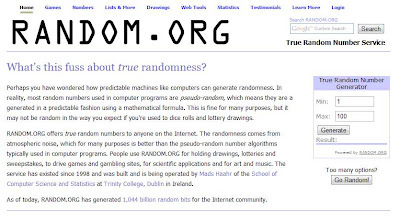 Introducing random.org. They're not a new service actually; they've been around since 1998. Still, I learned something new today. 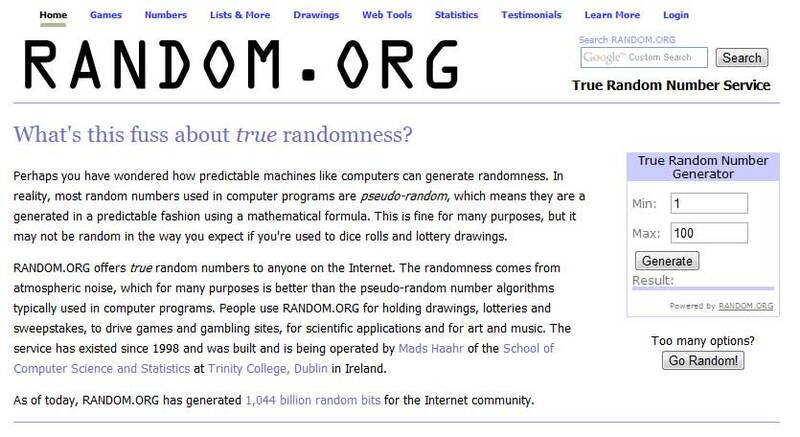 Most random number generators are not actually random. They're pseudo-random, owing to the fact that the results are generated by a mathematical formula. So in a sense the result was calculated, but in a random way. Random.org, however, offers true randomness courtesy of atmospheric noise. There's a huge number of free services, plus some paid ones. I'm sure you can find something to suit your random requirement (there's even one for lotto). If, for example, you need to pick a name from 6 selections, assign these a number each and use the dice (die?) app! Or, use an actual die if you have one! Oooh, now there's an idea.